How does one write when the feel they have nothing left? Sometimes the world weighs heavily, and the energy is gone. Whether the news of the day has paralyzed you or the amount of money in your dwindling bank account steals your focus, resistance will easily rob you the desire to write. It will allow fear and frustration to slow the process. You just succumb to the weight of it. You fall under the waterline. You loose creation. This is when the mind needs to empty. Look within. Know that when we have problems everyday that stunt our desire to write or to grow, the toil only fortifies what you will create down the road. Categories: Uncategorized | Tags: Creating, Depression, Inspiration, Rumi, Writing | Permalink. As Robin Williams became more and more famous in the late 70’s and early 80’s, it was getting obvious that he became a victim of his own fame. (Hello, cocaine and booze anyone? How about depression? Magazine publicity, fans tearing at him, comedy specials, parties, Belushi, parties, Belushi, parties. ) Trying to deal with the recent death of John Lennon, plus the trappings of celebrity he endured, Williams pitched an idea to Gary Marshall on how he – Robin Williams – meets Mork in a psychological meta situation were the actor playing the character opens up to the world about his personal struggle with fame. In turn, Mork learns about the trappings of celebrity public adulation. Very quirky and heady at the time, but in retrospect, shockingly sad and quite intelligent. Mindy is struggling to keep her job as a television reporter at a local news program. Robin Williams, the famous comedian is in town to perform and has been seen around visiting coffee shops, appearing at clubs and school functions. Everyone has met him, except Mindy – the one person who really needs to get to him for a featured interview or else she will be fired. How do you keep up the pace? You arrive from Hawaii, fly all night, then go straight to the university and go lecture for three hours. Then after the lecture – you performed until 3am at the Comedy Cabaret, and now you’re doing two shows tonight. Well, two reasons. You see I’m a performing addict. I can’t get enough. Also the owner of the Comedy Cabaret is a friend of a cousin and a friend of a friend, so, I couldn’t say no. I don’t know why I can’t say no. I guess I want people to like me. (I hate myself for that). But, I used to be able to say no. Before all this craziness started, my friends used to call up and go “Come on..we’re all going outside, there’ some gnarly waves, and we’re all going to hang out”, and I’d have to go “No my Mama say I have to stay inside and read Nietzsche tonight.” Later on, I guess I was afraid to say no because then they’d all say, like, “Oh…Robin William. Mr. Smarty Pants Big Shot. Oh, you forgot your old friends. Then, ‘lend me $10,000 for a new car’ when you tell them you won’t do the ‘shrimp’ benefit. This is none of my business but it seems that if they’re really your friends they’d understand. But it seems to me you can’t say no to a total stranger. It also looks like you’re probably taken advantage of a lot. You know if you learn how to say no, you’ll probably have a lot more time to yourself. Maybe that’s the last thing I want. Well, I hope I didn’t disappoint you. Disappoint her? Are you kidding? You’re breaking her perky little heart. I was always being the new kid in the neighborhood. Since I was suffering a case of the terminally shy, I couldn’t make friends that easily. I always spent a lot of time in my room and — I created my own little world. With all these little characters that had strange, unusual qualities. After a while, I realized that well, people found these characters funny and outrageous, then I got to the point where the characters could say and do the things that I was afraid to do myself. And, after a little while – here I am. 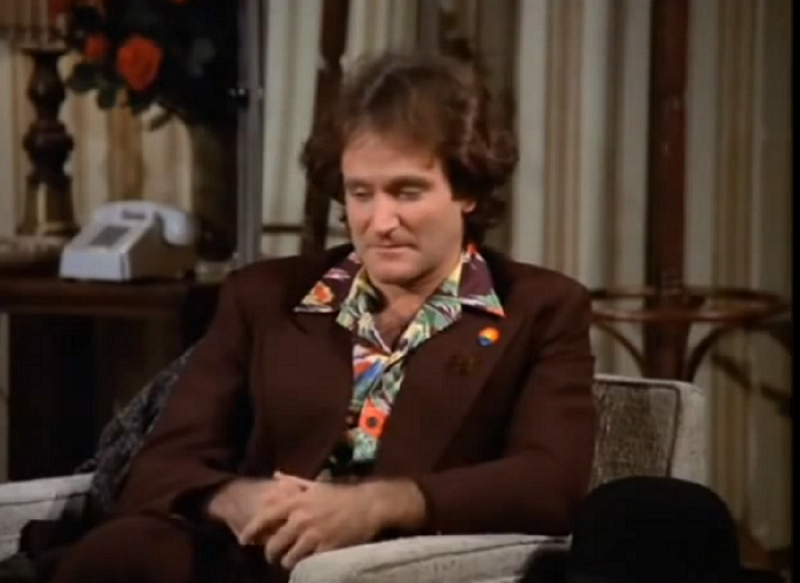 Categories: Thursday's 'Getting Through' | Tags: Depression, Mork and Mindy, Robin Williams, Television | Permalink. I encourage anyone who reads this post to share your feelings about Robin Williams, depression and loss in the comments section. Let’s have a conversation. It’s been over a week since the loss of Robin Williams. As one day moves forward into the next, turning that sad day to dust in our rear view mirror, the sadness overwhelms me now more than ever. My Netflix account has been busy, streaming his films: The Fisher King, Hook, The Birdcage. These are films I had seen years ago, but it was like viewing them for the first time. Each moment of the master gave me pause – each conversation and reaction. I drink in his presence, and cling to a beauty I’ve never noticed so acutely before. That’s all we have left of him. His films. The twinkle in his eye. The shazbots and the nanu’s, the “Oh Captain, my captains”… His talent was like a taste of God touching down on Earth. A little heaven. At least he gave us light for a little while. He’s not of this world anymore. Trying to make sense of the whys of his situation is a tough one. We’re strangers to the man. He gave so much to us, that his own mind and sanity is private – something only he and his family will and should know. Yet, how many of us have fallen into the hole? How many of us have wanted to walk off the precipice of this world, and take a dive to nowhere. I’m trying to make sense of it. He didn’t die from an illness like cancer or was killed in a car or airplane crash. He died from an illness that lead him to take his own life. It was preventable. Only one phone call, or just taking stock and stepping away from that room to slip under the covers with his wife on an ordinary night, sleeping an ordinary sleep, waking up on an ordinary day . But no. My heart sinks just trying to imagine those last moments. I flush from my mind all the graphic details the Marin County police department released. Yet, I still cannot imagine, someone so intent on dieing, that when one method didn’t work, he went for something else to take him out. What could have been in his mind to let him make the final decision? Did he feel he was a failure? Did he feel alone in a world of so many people who loved him? Did he justify his decision to end it all by convincing himself that his wife and kids would be better off without him? Shut the door on this sadness. Remember his laughter. And if you are depressed and are thinking of suicide, please don’t…don’t…don’t do it. Know that someone loves you. Know that you will get out of this. Know that if you decide to leap from that precipice, you will create a hole in the lives of many. And you don’t have to be as famous as Robin to do that. Categories: Uncategorized | Tags: Death, Depression, Robin Williams | Permalink.